We were delighted to attend the 2016 Scotland Food and Drink Awards in Edinburgh this week. 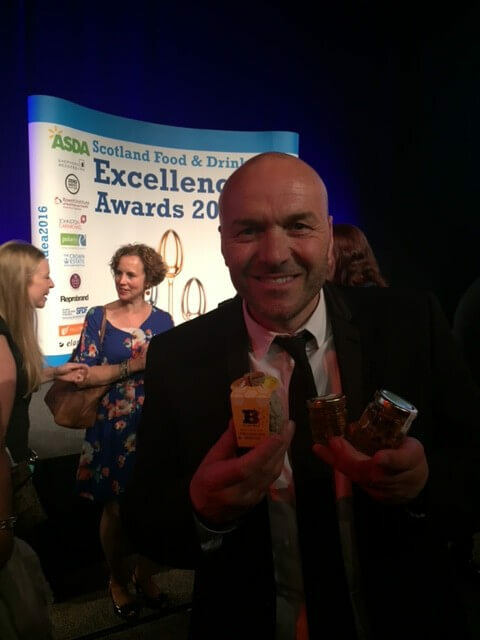 Television chef and presenter, Simon Rimmer from Channel 4’s Sunday Brunch did a sterling job as presenter on the evening. While Plan Bee wasn’t nominated, a number of our foodie friends picked up the much coveted awards on the night. And, there was great representation from a number of local Lanarkshire businesses too. Simon we hope you enjoy, and let us know what recipes you invent for our Honeygar and Italian Truffle Honey!